There has not been a larger focus on the Yankees’ minor league system in recent memory as there is throughout this 2013 campaign and especially into next year’s season. New York is riddled with player’s in their walk year, including: Robinson Cano, Hiroki Kuroda, Andy Pettitte, Phil Hughes, Joba Chamberlain, Curtis Granderson and Mariano Rivera. Players like Ichiro Suzuki and Vernon Wells have an additional year on their deals, but are by no means guaranteed starting roles next season. 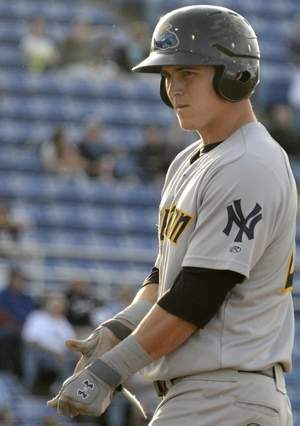 Enter: Tyler Austin. The Yankees’ number three prospect is presently at the AA level, younger and performing better than his high prospect counterpart, Slade Heathcott. Austin was a 13th round draft pick but exploded in 2011, hitting .354 during two short season stints as a 19-year-old. Now at the age of 21, Austin has recovered from a rough April and is hitting: .272/.365 with a 5/35 production line in 228 AB. Power is often considered the last thing to develop with a bat, but scouting reports don’t indicate Austin will ever be anything more than average in that department. Still, a player who projects to be a 20+ HR guy with a high batting average means Austin could be a long-term right field solution. With a quick bat, good base-running ability and average speed, Austin could be solid on both sides of the game and a strong arm and smart approach to the plate implies he could be MLB ready as early as next season. If Austin continues to heat up through the summer, he could see a September callup to an outfield presently struggling with well past their primes, Suzuki and Wells in the corner outfield spots. New York has struggled against lefties for a month or so and Austin could easily grab significant playing time in September whether the Yankees are in the playoff race or not.